Enugu Electricity Distribution Company says youths engaging in acts of vandalism have refused to heed the call by EEDC to shun this act. The number of persons willing to take the risk of vandalising electrical installations are increasing, but sometimes a few of them are unlucky. Playing with live wire is like playing with your life, but the warning of the Enugu Electricity Distribution Company (EEDC) has fell on deaf ears. The company said at least eight suspected vandals have been arrested in two weeks in various parts of the South-East. 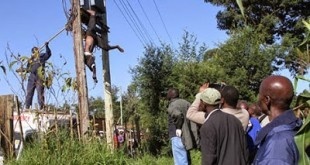 Mr Emeka Ezeh, the EEDC’s spokesman, said in a statement in Enugu on Friday that a middle-aged man was electrocuted while vandalising electrical installations. Ezeh said the electrocuted person and the eight suspected vandals were arrested in four states - Anambra, Ebonyi, Enugu and Imo States. "Two suspects identified as Amaechi Akpu and Chigbo Ejebu were apprehended by youths of Onuore Agba community in Ebonyi for vandalising of a 300KVA Sub-station, property of EEDC located in the community. "Members of Abor vigilance group also arrested a vandal identified as Emmanuel Izunna for vandalising 500KVA Igwe Umuenyiora 2 Sub-station located in Ogbunike in Anambra," he said. “At Ogidi, Anambra State, the vigilance group arrested two vandals identified as Chukwudi Oforka and Godwin Onwansa for vandalising Anaka Town Sub-station located in Ogidi community. “While Ahmed Inusa, Aliu Abubakar and Umaru Jahe were arrested by vigilance group for vandalising the Umuabiahu 300KVA Sub-station located in Orlu, Imo State,” he said. Ezeh, however, said that luck ran out on an unidentified vandal as he was electrocuted while attempting to vandalize Onuseleogu 100KVA Sub-station, property of EEDC, located at Emene Industrial Layout, Enugu. “It was gathered that the vandal, who is a middle-aged man, probably arrived at the substation when there was no supply and in the process of loosening the HV fuse, supply was restored and he was electrocuted. “Items recovered from the victim were spanners, a torch light and pliers. “His remains was evacuated to University of Nigeria Teaching Hospital (UNTH), Ituku-Ozalla morgue by the Police from Emene Division,” he said. According to him, it is evident that the youths engaging in the act of vandalism have refused to heed the call by EEDC to shun this act.